When the going gets tough, it’s usually finance-related. 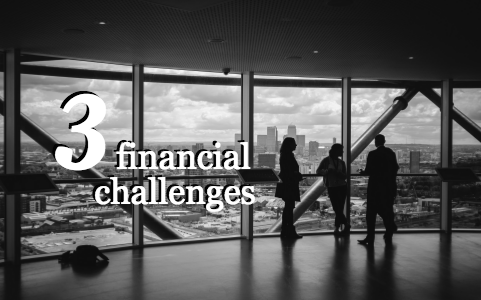 Here are the three challenges you may be facing with your small business, and tips to overcome them. Every small business knows that cash flow is a top priority. You need liquidity in order to channel funds into your other top strategic priorities. According to Simon Dell at Business.com, this is a domino effect that not only impacts your business, but all the other businesses you work with. Dell points out that this situation shouldn’t make you feel stuck in a cash flow rut. It’s hard to find a small business owner who hasn’t felt the pressure of operating their business effectively while also managing all the day-to-day financial management. From dealing with expenses, receipts and invoices all the way to tax-time issues and end-of-year reporting, these are the administrative duties that most SMBs dread. Investopedia offers a straightforward solution: get professional help. “Year after year, owners listed access to funding as one of their most formidable concerns facing the future of their businesses,” states Ryan Weaver in The Globe and Mail’s business growth column. Finding a trusted alternative lender can be the perfect solution in these circumstances. And many SMBs find trusted lending partners that they can build ongoing relationships with in order to access funding with much more ease. This can be a big advantage when business demands become timely, such as when you must fulfill an unexpectedly large order or hire more staff for a new project. Asset-based lending may also be an option for businesses in a large growth phase that have significant business assets such as inventory, machinery or real estate to leverage. Consider looking at all the alternative funding options that can bridge you to the next step in your business growth. Your business is not restricted to traditional lenders and a trusted alternative source can give your business growth the kick-start it needs.